What is the Category Quick View feature? 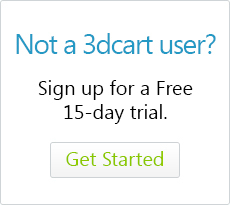 3dcart's Quick View feature allows you to give your shoppers a quick preview of the product right from its respective category listing. This can help save them time when navigating your store since it allows one to essentially view the product listing's main information without leaving the base category. From there, your shoppers can either click through to learn more about the product, add to cart right from the quick view window, or otherwise return to the previous category page. The Category QuickView feature currently only works for your store's category pages. Home Specials, Browse by Price, and Shop by Brand listings are not category pages per se, therefore the Category Quick View will not apply to these. Use the search bar and search for "Quick View"
Look for "Enable Quick View"
When they click on the "Quick View" button itself, a small pop-up window will come up showing the main details of the product information. Advanced users can edit the basic display of the Quick View feature by editing the Quick View template. The template itself is named "quick_view.html" and may be found via FTP by going to web/assets/templates/common. If you have specific design changes you'd like to add to the Quick View function, our custom design team can also help with these changes. Please contact your respective Account manager for more details.